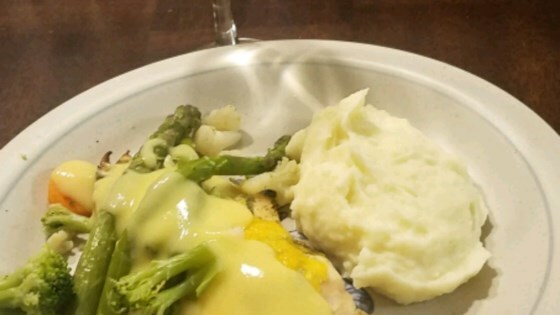 "Chicken breasts marinated in white wine and herbs, then grilled and served with steamed asparagus and hollandaise sauce. Had it once in a restaurant, tried to recreate it for my wife and this is what I got." To Marinate: Place chicken in a nonporous glass dish or bowl. Pour wine over chicken, then sprinkle with tarragon. Cover dish and refrigerate to marinate for 2 hours. Remove chicken from dish or bowl, discarding remaining marinade, and broil/grill for 25 minutes or until cooked through and juices run clear. Meanwhile, prepare hollandaise sauce according to package directions. When chicken is cooked, place 4 spears of steamed asparagus on each chicken breast and dribble with prepared hollandaise sauce to taste. Sprinkle with cheese and serve. Be careful not to let the chicken marinate more than the 2 hours. I marinated for about 4 hours and it turned out horrible. All I could taste was the wine. We really enjoyed this recipe. For a simpler version, bake the chicken directly in the prepared hollandaise sauce and top with asparagus. This was awesome. I out the chicken on top of brown rice and that was a good extra. Thanks! Great recipe. I used bernaise sauce instead of hollandaise and less cheese (we don't use much in any dish).